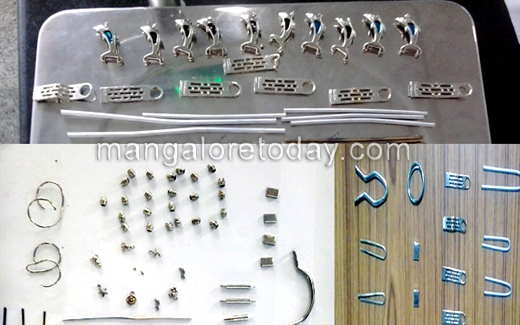 Mangalore, Sep 20, 2014: The officers of Customs at Mangalore International Airport seized gold, totally weighing 878 gms valued at Rs.23.48 lakh, in two separate cases on Saturday, Sept 20. A press release by the Customs Department said here that in both the cases the officers seized gold in the form of wire rods, beads, pieces in assorted sizes and shapes. 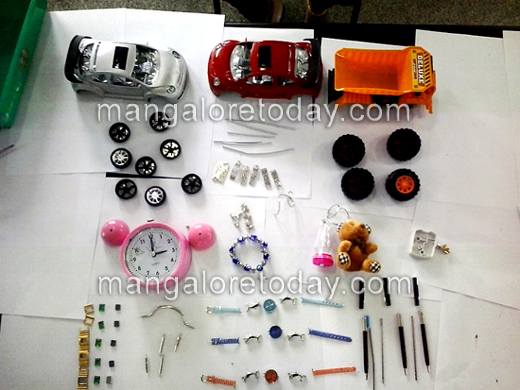 In the first case, the officers seized gold in the form of wire rods, beads, pieces in assorted sizes and shapes totally weighing 436 grams and valued at Rs 11,66,300, concealed in watch straps, toy cars, pen refills, electric plugs, key chain, magnetic wrist band, fancy chain/bracelet, alarm clock, zip holder (puller) of bag pack etc, which were kept and brought in checked in baggage. The gold was seized from the possession of a passenger identified as Mohammed Ashraf Parakatta, residing of Kudlu, Kasaragod, who arrived at Mangalore International Airport on September 20 at around 0445 hours by Air India flight No IX 814 from Dubai, the release said. In a similar modus operandi on the same day, the officers seized gold in the form of wire rods, beads, pieces in assorted sizes and shapes, totally weighing 442 grams and valued at Rs 11,82,350 concealed in watch straps, toy cars, pen refills, electric plugs, key chain, magnetic wrist band, fancy chain/bracelet, alarm clock etc, which were kept in the checked in baggage. The gold was seized from the possession of another passenger named Suhaib Thalangara Mohamood, residing at Thalangara Post, Kasaragod, who arrived at Mangalore International Airport on September 20 at around 0815 hours by Jet Airways flight No 9W531 from Dubai. Operations were conducted under the supervision of Krishna Kumar Prasad, deputy commissioner of customs, Mangalore International Airport. Further investigation is under progress in the above cases.